The Beaufighter Mk. X was probably the ultimate wartime Beau. In this plane you had the ability to operate as both a 'normal' fighter-bomber or, with the installation of torpedo-carrying mounts, a lethal ship-killer. The Mk.X was also the recipient of several airframe mods, one of the most striking being the addition of a large dorsal strake to help improve stability during take-off. This was especially helpful when carrying a torpedo. 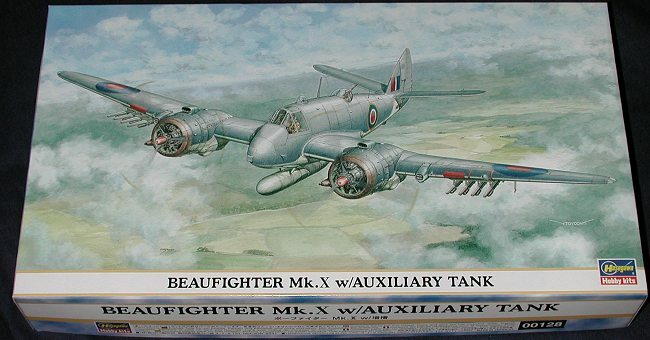 Most Beaufighter Mk.X aircraft were used in the anti-shipping roles and so were supplied to Coastal Command squadrons. Normal offensive load was 8 rockets in addition to the 4 20mm guns carried in the nose. The observer/radio operator had a single .303 for tail defense. The Beaufighter was also used in the Far East and after the war, several were exported to places like the Dominican Republic. One thing about the newer Hasegawa kits is that you do get a lot of plastic for your money. This particular kit seems to have just about every sprue that was designed for this kit, though I don't see the one for the torpedo. Always looking for ways to extend the life of the mold, this one has as its selling point an auxiliary fuel tank that is carried under the fuselage. Of the several references I have on the Beaufighter, only the Warpaint book on this plane had a photograph of this fuel tank being used. It was on a 45 Squadron aircraft at Seletar in Singapore in 1949. Judging from the two decal options given (one for the aforementioned aircraft), and the fact that both have underwing serials, this appears to have been a post-war addition. The tank fit right on to the torpedo mounts. The kit itself is well engineered and is very much a modern kit with multiple options available to the builder. As you can read from a build of the MkVI done last year, the kit builds into a very nice model. You will, however, have to find the proper exhaust from an aftermarket source as this kit has the same simplified ones that really need to be replaced. The instructions are excellent as always and you have two decal options. Actually, the two aircraft, while both being Mk.Xs, are very different from each other. 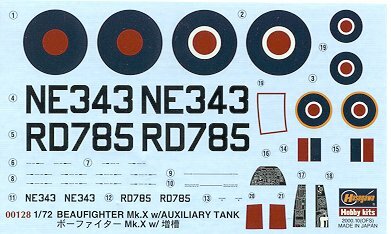 NE 343, the plane shown on the box art, is in dark sea grey upper with sky lower surfaces. It has a 'normal' nose and no fin extention. RD 785, the other option and the one that is in the photo I found, has a dark green/dark earth upper with sky lower . This plane has the fin extension and a 'thimble nose' for the airborne radar. Either scheme would look quite nice. Overall, this is a really nice model. It is a bit unusual in that the auxiliary tank was not used until after the war, but that only adds to the interest. 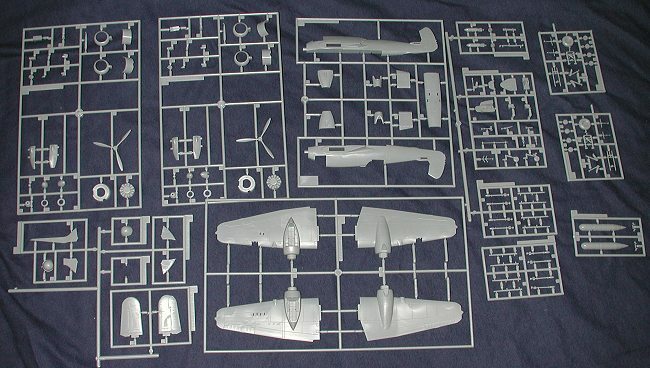 It is one that you should consider if looking for a Beaufighter kit. Review kit courtesy of Marco Polo Importers. Thanks for your support. If you would like your product reviewed fairly and quickly by a site that averages over 2,600 visits a day, please contact me or see other details in the Note to Contributors.